It took until the second presidential debate, the town hall one where Obama recovered his momentum, for the campaign to turn to gun laws. The moment was brief. Nina Gonzalez, one of the New York voters in the line-up, asked the president what “your administration done or planned to do to limit the availability of assault weapons.” The president gave a meandering, careful answer, with one piece of news. We’re a nation that believes in the Second Amendment, and I believe in the Second Amendment. We’ve got a long tradition of hunting and sportsmen and people who want to make sure they can protect themselves. And so what I want is a – is a comprehensive strategy. Part of it is seeing if we can get automatic weapons that kill folks in amazing numbers out of the hands of criminals and the mentally ill. But part of it is also going deeper and seeing if we can get into these communities and making sure we catch violent impulses before they occur. My emphasis. The president had avoided the gun issue up to that point. And that made sense. Democrats did not re-introduce the assault weapons ban when they had control of Congress. Starting in 2011, a new Republican majority in the House made it obvious that no such ban would move. And this started very early in their term, when Rep. Gabrielle Giffords was shot in the head by a gunman with an extended clip. Rep. Carolyn McCarthy, who has become one of the few remaining, consistent gun control advocates in the House, introduced a bill to ban the sale of those clips. It got nowhere. 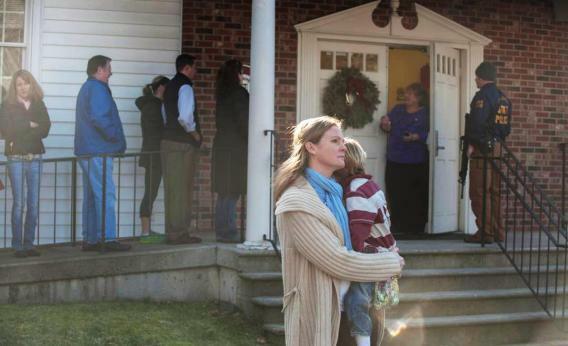 According to the AP, the suspected shooter in Newton, Connecticut used a .223 caliber rifle to kill up to 30 people, mostly children. We don’t know what kind of rifle exactly, but Guns and Ammo recently reviewed that caliber, discussing whether it was the best kind for home protection. When using rifle ammunition with projectiles designed specifically for personal defense, such as Winchester’s new .223 PDX1 loadings, fragmentation is assured. Bullets striking an intruder will separate into smaller, lighter pieces and—most likely—not overpenetrate and exit the body as errant shrapnel. All of the energy generated will then be transferred into the target. If the round fired is a miss and hits only wood or drywall, the projectile will break apart into smaller pieces—while these are still dangerous, their potential for injury, or penetration of additional walls, is much less than a pistol bullet or buckshot pellet. Many SWAT teams are using M4-type rifles, and overpenetration, when your teammate may be on the other side of the wall, is a major concern. So: We have a president, who doesn’t need to fret re-election, who wants to restrict weaponry “designed for soldiers in war theaters.” We’ll eventually have a clear idea of what weaponry was used, and how it was purchased. And we have a Congress that, recently, had no interest in moving on any of this.